Five state champions…one for each month that the Cedar Springs Youth wrestlers have worked toward the MYWAY State Wrestling Championships. Since early November, youth wrestlers and coaches have been sacrificing and training in hopes of earning the coveted title of State Champion. 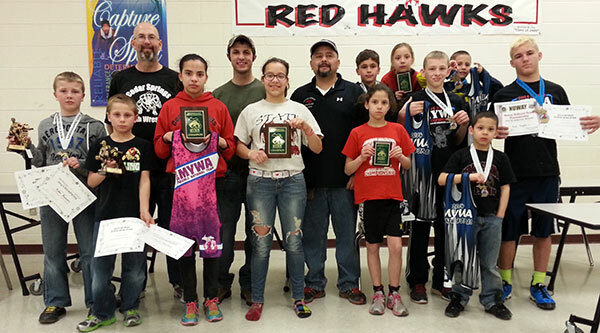 Twenty of those Red Hawks, along with approximately 2,500 other youth wrestlers, earned their spot to wrestle at the 2015 MYWAY State Championships, held at the Kellogg Arena in Battle Creek, Michigan, March 28, 29 and 30. Of the 20 who competed, twelve of them placed in the top eight, further qualifying them to compete in national events. Possibly the biggest accomplishment of any club in the state of Michigan is that Cedar Springs Youth Wrestling had five wrestlers crowned 2015 State Champions! Eighth grader, Ryan Ringler, went 4-0 to earn his fifth State Champion title! Ringler’s second period pin in the championship round against Aaron Gilmore of Donahoe secured his 2015 State Champion Title in the 170lb, 13/14 division. Allexis Gonzales, also an eighth grader, took Girls State Champion in the 14U division at 130lbs. She went 5-0, winning her first four matches by pins. She earned a minor decision in her championship match against Kelsy Coger of Pennfield. Seventh grader, Reese Gonzales, went 4-0, pinning all of her opponents, in a round robin. She earned Girls State Champion at 110 lbs in the 14U division. Her toughest match was against runner-up Payton Smith of Clio, who she pinned in the second round. Zoe Gonzales battled her way to Girls State Champion at 76lbs in the 11U division. Gonzales went 3-0, winning each match by only one point. In the championship round, she beat Karlie Woodall of Coloma, with a score of 3-2. Gonzales won after she earned a reversal in the last few seconds of the third round. Cora Gonzales was the youngest Girls State Champion for the Red Hawks this year. Gonzales, who wrestled at 52lbs in the 9U division, went 4-0, with 3 pins and one decision. She won her State Champion title with a 5-0 decision in the final round against Tricia Pyrzewski of Gladwin. Freshman George Gonzales Jr. battled the toughest side of the 20-man chart to earn his second place finish. With a record of 4-1, he suffered his only loss, at 174lbs in the 15/16 division, against Trevor Piggott of Ionia. Seventh grader Rosie Castro finished in second place at 122lbs in the 14U Girls Division. She had first and second round pins to secure her spot in the championship round where she took runner-up to Kennedi Gotha of Linden. By placing in the top three spots at State or top two in the Girls division, all seven wrestlers listed above won a custom championship singlet and the opportunity to be partially sponsored by MYWAY for national tournaments. The next five wrestlers below battled tough, but were unable to secure a top finish. Six-year-old, Veronica Tapia was the only girl in the area who competed in both the MYWAY State Finals and the MYWAY Girls State Finals, wrestling a total of 12 matches! Tapia went 5-2 on a 32-person chart to take fourth at 40lb in the 4/6 division. She went 3-2 at 40lb in the 9U Girls’ division to take third. Keaton Klaasen had a very impressive 6th place finish at 52lbs in the 7/8 division. He went 5-2 on a chart of 31 wrestlers. The girls rounded out the results with 6th and 7th place finishes in the Girls Division. First year wrestler Madisyn Britley took 6th in the 11U HWT division. Analize Tapia took 7th at 43lbs in the 9U division. Brooklyn Wright finished 7th at 122 lbs in the 14U division. 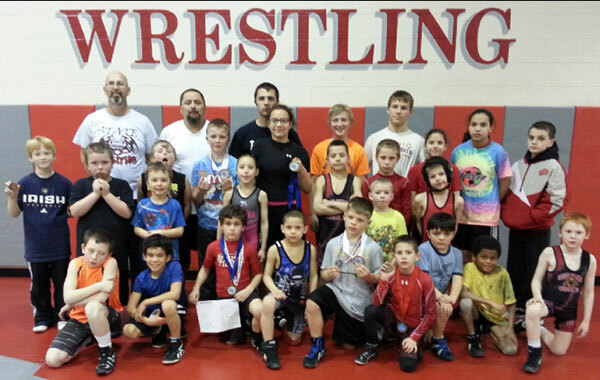 Cedar Springs Youth Wrestling Club has been and continues to be one of the most successful youth wrestling clubs in the state of Michigan. Head Coach George Gonzales Sr. attributes that to the hard work and dedication of the volunteer coaches and the wrestlers. Veronica Tapia 2nd at 40lb in the 4-6 year division. In the 7/8 year division placers were Luke Bouwens 3rd at 46lb, Keaton Klaasen 4th at 58lb , Hudson Crystal 3rd at 64lb, and Wyatt Cooper 1st at 97lb. In the 9/10 year division were Logan Troupe 3rd at 80lb and Carter Falan 2nd at 85lb. In the 11/12 year division were Andrew VanGessel first at 75 lb, Aiden Bouwens 4th at 119lb and Kayden Scott 2nd at 158lb. In the 13/15 year division were Fred White 1st at 80 lb. Wayne White, the lone high schooler, took 3rd place in the High School Division at 148lb. The final regular season tournament was held on Sunday, March 8, at TK Middleville, where the Hawks continued to impress, bringing home a total of 15 medals. In the 4/6 year division were Veronica Tapia first at 40lb and Tucker Crystal 4th at 40lb. In the 7/8 year division were Cora Gonzales 2nd at 55lb, Pistachio Gonzales3rd at 64lb, Hudson Crystal 3rd at 64 lb, Wyatt Cooper 1st at 97lb, and JuanAngel Acosta 2nd at 97 lb. In the 9/10 year division were Tacho Gonzales 3rd at 75lb, Carter Falan 3rd at 85lb and Madisyn Birtley 4th at 100lb. In the 11/ 12 year division were Andrew VanGessel first at 75lb and Kayden Scott 2nd at 133lb. Austin Emmorey took 3rd in the 13/15 year division at 107lb. Cedar Springs rounded out the tournament with two placers in the High School Division. Those placers were Wayne White 2nd at 143 lb and George Gonzales Jr. 1st at 174lb. 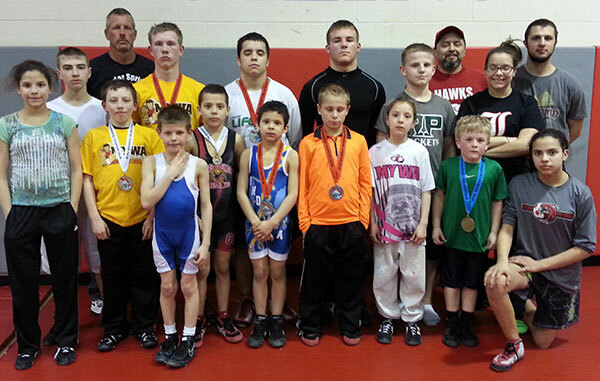 Make sure you check next week’s Post for the Western Regional results for the Cedar Springs Red Hawk youth wrestlers. Top four placers in each age group and weight division will be headed to MYWAY State finals March 27 thru 29th held at the Kellogg arena in Battle Creek, Michigan. Cedar springs youth state placers and coaches. Missing from photo is Veronica Tapia. 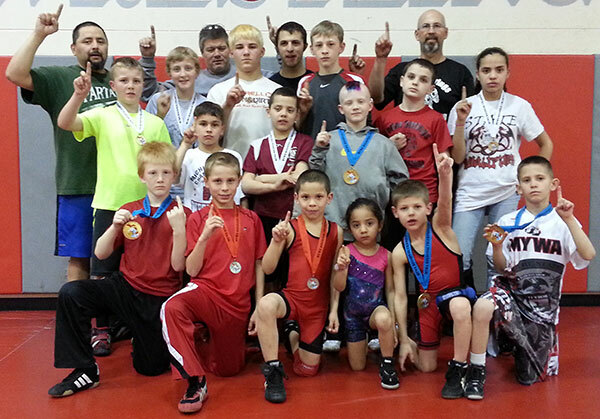 Visit Cedar Springs Wrestling on Facebook to follow your local youth and high school champions. Months of hard work and dedication to one of the toughest sports known to man has paid off for Red Hawk youth wrestlers. From March 28 to March 30, over 2,500 wrestlers, ages 4 to 19, competed at the MYWAY State Championships held at the Kellogg Arena in Battle Creek, MI. 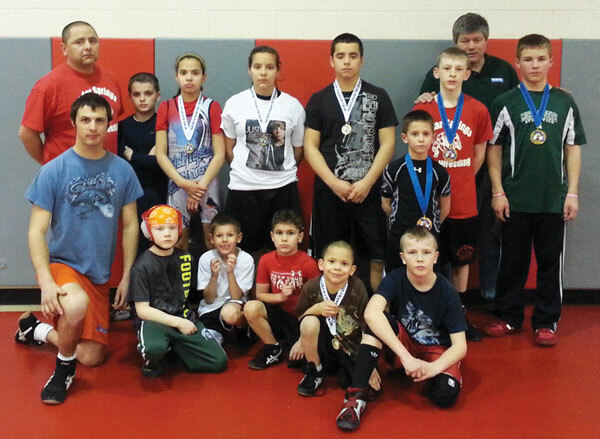 Cedar Springs Youth Wrestling Club sent a grand total of 17 state qualifiers to compete at the finals. Of those 17 wrestlers, 12 placed in the top 6, further qualifying them to compete at Nationals. Another accomplishment, not held by any other club in the area, is that Cedar Springs crowned a total of four 2014 State Champions this year! Landon Demorest took on Mason Willis from Jr Marauders in the championship round. Demorest, who had a career record of 1 win and 2 losses against Willis, defeated Willis with a score of 3-2, making him the 2014 State Champion in the 47lb 9/10 division. Ryan Ringler went undefeated, 4 pins and one decision, on a chart of 30 wrestlers. Ringler, with a second round pin against runner-up Devin Trevino from Oxford, was crowned State Champion at 158lb in the 11/12 division. Sisters, Reese and Allexis Gonzales both took State Champion in the first MYWAY Girls State Tournament. Reese, who weighed in at 92lbs, earned her State Championship title with first round pins against all of her opponents in the 12 and under Heavy Weight division. Allexis, a seventh grader, took State Champion with one pin and two decisions in the 14 and under 122/130 combined weight division, taking championship over 8th grader, Brittney Ratliff from Onsted. Pistachio Gonzales battled his way back on a chart of 26 wrestlers after suffering a second round loss to state runner-up, Da’Quavon White from Pontiac Huskies. He worked back to take third at 58lb in the 5/6 division! Tommy Stevens, who wrestled at 58lb in the 7/8 division also worked his back on a 33 person chart. Suffering only one loss, Stevens took third after a 45 second pin against Oxford wrestler, Auggie Anderson. Cora Gonzales, who competed at 52lb in the Girls 8 and under division, took a very impressive third place finish. This was her first year wrestling and she plans to continue. Rounding off the third place finishers, was high schooler, Jordan Ringler. After his initial loss in the second round, Jordan won his next five matches, three pins and two decisions, to take third place against Michael Gibbs from Waterford. Zoe Gonzales took fourth in the Girls State 12 and under 76lb division. Veronica Tapia took fifth in the Girls State 8 and under 44lb division. On a 29 person chart at 63lb in the 9/10 division, Trevor Marsman wrestled his way to a sixth place finish with a total of four wins and two losses. Aiden Bouwens, who went 4-2 on a 20 person chart, also finished sixth place at 100lb in the 9/10 division. The Cedar Springs Youth wrestlers did very well during the 2014 season and will continue to excel against some of the toughest wrestlers here in Michigan and the nation because they ARE the toughest. They work hard and are determined to be champions. On Saturday, March 15 and Sunday March 16, MYWAY Wrestling Western Region held Regional Finals at Kenowa Hills High School. Wrestlers have spent the last four months competing in preparation for the tournament. Competition was fierce as the top wrestlers in the western region came to compete to place top four in their weight classes in order to qualify for the MYWAY State Finals. Twenty three Cedar Springs Youth Wrestlers went to regionals and seventeen of those qualified for State Finals, four whom where Champions! 2014 Western Region Champions are Veronica Tapia at 37lb in the 5/6 age group, Keaton Klaasen at 52lb in the 7/8 age group, Landon Demorest at 47lb in the 9/10 age group, and Ryan Ringler at 158lb in the 11/12 age group. Second place finishers were Pistachio Gonzales at 58lb in the 5/6 age group, Tommy Stevens at 58lb in the 7/8 age group, Trevor Marsman at 63lb in the 9/10 age group, and Jordan Ringler at 106lb in the 99-98 High School division. Third place finishers Aiden Bouwens at 100lb in the 9/10 age group, Logan Hull at 85lb in the 11/12 age group and Samuel Couturier at 112lb in the 11/12 age group. Rounding out the state qualifiers in fourth place were Caleigh Wood at 37lb in the 5/6 age group and Gage Gardner at 145 in the 13-15 age group. Reese and Tacho Gonzales both fell one win short of qualifying by taking fifth place in their weight classes. Cedar Springs will also be sending four girls to the MYWAY Girls State Championships,which will be held in conjunction with regular state finals. Allexis, Reese, Cora, and Zoe Gonzales will all be competing in the girls only tournament. MYWAY State Finals will be held this weekend at the Kellogg Arena in Battle Creek, MI from Friday, March 28 until March Sunday, March 30. Anyone wanting to come out and watch the best wrestling in the state of Michigan can get the full schedule at www.mywaywrestling.com. Cedar Springs youth wrestlers and coaches would like to thank the Post and its readers for their support by printing and reading the wrestling results each week. It has been a great season, with many more to come. On Sunday, March 2, Grand Valley State University hosted one of the last two regular season tournaments at the campus field house. Competition was fierce, as over 600 wrestlers from all over the state of Michigan attended. Seven Red Hawk youth wrestlers brought home medals. First place finishers were Caleigh Wood at 37lb in the 5/6 age group, Tommy Stevens at 6lb in the 7/8 age group and Allexis Gonzales at 122 pounds in the 13/15 age group. Second place finishers were Pistachio Gonzales at 55lb in the 5/6 age group and Wyatt Cooper at 82 lbs in the 7/8 age group. Third place finishers were Carter Falan at 80 lb in the 9/10 age group and Gage Gardner at 145 lb in the 13-15 age group. 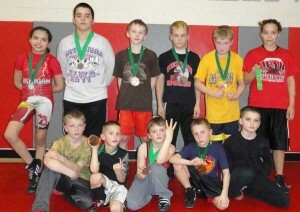 On March 9, 10 wrestlers won medals at the last regular season tournament hosted by Cedar’s backyard rivals, Rockford. First place winners were Veronica Tapia at 37lb in the 5/6 age group, Pistachio Gonzales at 58lb in the 5/6 age group, Tommy Stevens at 58lb in the 7/8 age group and Landon Demorest at 51lb in the 9/10 age group. Chase Sarniak took second at 46lb in the 5/6 age group. Third place finishers were Caleigh Wood at 37lb in the 5/6 age, Wyatt Cooper at 82lb in the 7/8 age group, Lane Wiggins-Russo at 112 in the 7/8 age group, Aiden Bowens at 95lb in the 9/10 age group, and Sergei Byxbe in the 110 pound 9/10 age group. Regionals held at Grandville High School on March 9 and 10, 2013. This year Cedar Springs Youth Wrestling Club is boasting a total of fourteen regional placers, 10 of whom are MYWAY State qualifiers. Of those 10 state qualifiers, four were Regional Champions! This year’s Regional Champions were Landon Demorest in the 7-8 year old 43 lbs division, Braden Hallman in the 7-8 year old 61 lbs division, Ryan Ringler in the 11-12 year old 119 lbs, and Jordan Ringler in the 13-14 year old 85 lbs division. All four of these champions were undefeated this year in regular season tournaments. They will be leading the Red Hawks into the State Finals to be held this weekend, March 22, 23 and 24, at the Kellogg Arena in Battle Creek. Additional state qualifiers were those who finished in the top four of their divisions. Keaton Klaasen took second in the 4-6 year old 46 lbs division. Third place finishers were Austin Averill in the 4-6 year old 37 lbs, Reese Gonzales in the 11-12 year old 85 lbs, Gage Gardner in the 11-12 year old 119 lbs, Allexis Gonzales 11-12 year old 126 lbs, and George Gonzales Jr. in the 13-14 year old 155 lbs division. The last four regional placers narrowly missed their chance at finals by taking 5th and 6th in their divisions. 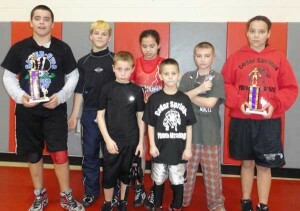 Logan Hull and Bryce Hallman both took fifth place in the 11-12 year old division; Logan at 75 lbs and Bryce at 100 lbs. Pistachio Gonzales and Aiden Bouwens both finished in sixth place; Pistachio in the 4-6 year 52 lbs division and Aiden in the 9-10 year 85 lbs division. Hundreds of wrestlers were put out of the tournament within the first several rounds of wrestling. All of these wrestlers worked very hard to place at regionals. Good luck to those who are attending State Finals this weekend. Get out there and show them what Cedar Springs is made of, Champions! Ryan Ringler, age 11, son of Paul and Jane Ringler of Cedar Springs, has learned from a early age what it takes to be a champion. When many kids are enjoying video games and watching TV after school, Ryan and his brother Jordan are on a wrestling mat. The Ringler boys began wrestling as early as their preschool days. Over these years, the boys have become accustom to starting the season in November and practicing most days of the week for half of the year. This commitment and determination leads them to the annual spring state finals and also the national tournament for youth wrestling—the two largest and most meaningful competitions for every wrestler. All the time, effort and hard work paid off just two weeks ago, when Ryan accomplished his goal by taking state champion, for the third time, for Michigan. He pinned every opponent. And this past week, he attended the national competition and was awarded the National Champion title for the 100-pound weight class. This was Ryan’s first individual national title. Only the top four wrestlers in each state could participate in this prestigious competition. Ryan is no stranger to a national championship. This past winter, he tried out and was accepted on to the elite, (MyWay) Michigan, travel team. They battled against several elite, out of state teams. At the end of these duals, Michigan conquered and took home the champion title. 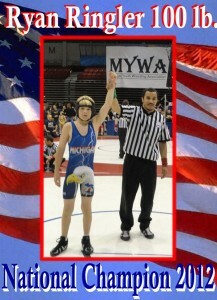 Ryan had contributed to this national victory, as he pulled out a win every time he took the mat. When asked about the state and national tournaments, Ryan never questioned if he could do it. He believed in himself and this was his year. He prepared and worked out, even on those days he didn’t feel like exerting himself. Given the tough, frustrating, contact sport that wrestling is, and the practice time that it takes to be successful, Ryan showed commitment, respect for his fellow wrestlers and for the officials. He continually presented a good attitude and sportsmanship. That is what his family is truly proud of. Ryan’s older brother Jordan also made the national team. Both boys will continue to travel with these teams this summer. Jordan placed 3rd at the state finals and should be given much credit for Ryan’s success, due to the motivation and help given to his younger brother all year. MYWAY Western Regionals were held in Muskegon on March 10 and 11 at Orchardview High School. Over 600 wrestlers in attendance were vying for the four top spots in their weight classes in hopes of advancing to the MYWAY State Finals. Competition was the toughest it has been all year and the Cedar Springs youth wrestlers rose to the occasion with a grand total of twelve state qualifiers. Of those twelve, five of them were crowned regional champions! Regional champions were Landon Demorest, Logan Hull, Trevor Marsman, Ryan Ringler and Jordan Ringler. Wrestlers who took second were Samuel Couturier, Reese Gonzales and Trenton Snoeyink. Maston Wood took third. Aiden Bouwens, George Gonzales Jr and Jeremy Wildfong took fourth. Allexis Gonzales just missed the qualifying spot by taking fifth. These wrestlers will be attending the state finals to be held this weekend, March 23, 24 and 25, at the Kellogg Arena in Battle Creek. Let’s go Red Hawks! On March 4, 2011, Greenville held the last regular season tournament for the 2012 MYWAY Wrestling. The trophy tournament was capped at 400 wrestlers to avoid being overcrowded by those looking to win the coveted trophies. The youth Hawks did quite well, bringing home a total of nine trophies. First place winners were Landon Demorest, Aiden Bouwens, Trevor Marsman, Logan Hull, Ryan Ringler and George Gonzales Jr. Alone in second place was Reese Gonzales. Allexis Gonzales and Jeremy Wildfong took fourth in their divisions. Austin Emmorey also competed that same weekend in Montabella, taking 3rd in his division. 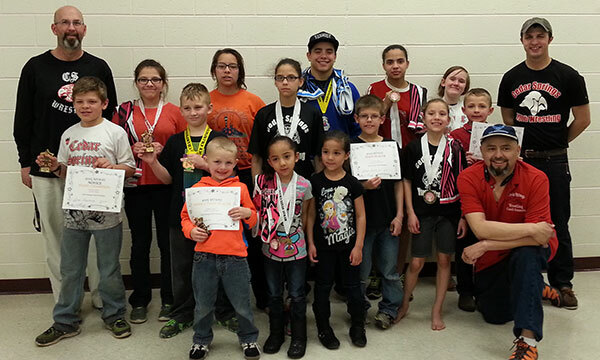 Overall it has been a very impressive regular season for the youth wrestlers. Make sure you see next week’s regional results to see which of your favorite wrestlers qualified for state finals.